Who doesn’t like a little kiss now and then? It’s the holiday season and there are kisses of all types to be had. Mistletoe kisses, peanut butter cookie kisses, Santa Claus kisses from mommy (or maybe daddy,) and now thanks to a stroll down the frozen case aisle of my local grocery store, Puffed Cranberry Kisses. 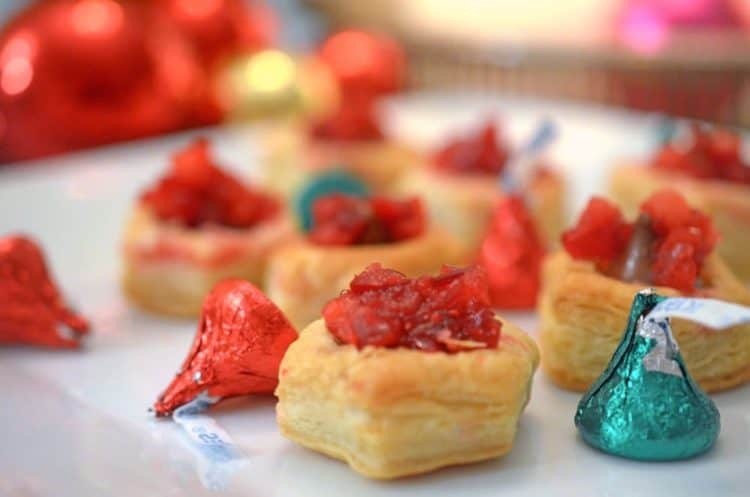 We were getting ready to put some Holiday Wonton Kisses together and a few other recipes that use Hershey’s Kisses when I noticed some small boxes of puffed pastry cups. 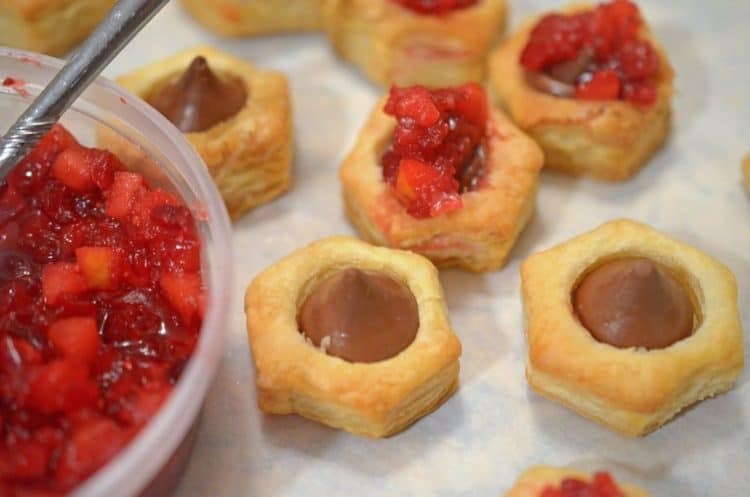 Thinking that some kisses would fit well in the center of those cups I threw a box of the little pastry cups into my cart and continued on my way. Not more than a few feet away from where I found these pastry cups, I spotted a small container of frozen cranberry orange relish. We had put a batch of this together last year for Platter Talk and having never seen it prepared commercially, I was intrigued and decided to pick some up. That’s about when this idea hit me. Hershey’s Kisses. 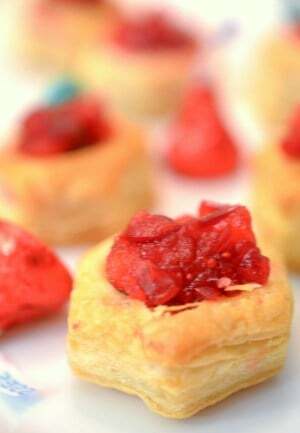 Puffed pastry cups. Cranberry orange relish. Voilà! Simple to put together and a classic combination of flavors. What could be better? As I pulled these out of the oven, the answer was obvious: Nothing. These are bite size nugget of pure goodness. 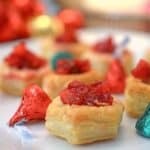 They’re perfect for the holidays, as a sweet appetizer, a snack, or a festive and delightful little dessert. 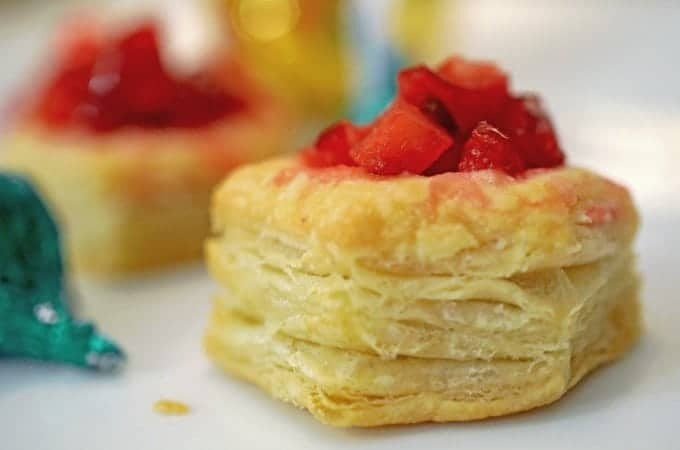 Bake puffed pastry for 15-20 minutes, until light golden. 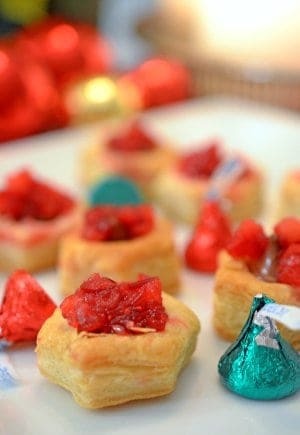 While pastry is in oven, unwrap the kisses. Remove from pastry cups from oven and immediately place unwrapped kisses in center, pushing chocolate all the way to bottom of cup. Using teaspoon, carefully top chocolate with relish. Serve immediately and thank me later. What an easy charming idea. Of course I love kisses. Ha. They really look pretty and I was enchanted with the name of the recipe. Yum these looks so good! Patty, These taste as good as they look! What a simple but brilliant recipe this is. Delicious Puffed Cranberry Kisses for any holiday menu. I love when all the components come together on a whim. This is a winner. Thanks for sharing your recipe.